ADIVAN USBD-M 2.0 is a Flash Drive duplicator intended for high volume duplication. Copy your USB Flash Memory fast, easy and reliably. 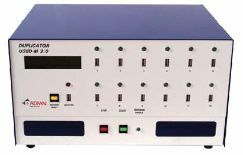 The USBD-M 2.0 is a standalone device that works without monitor and keyboard. It consists of 12 slave slots and one master slot. The master slot is intended for master flash drive and then each slave slot works independently. Volume of master flash is copied to slave flash immediately after pull down the flash drive to the USB connector. The USB slots could be extended of multiple 14 slave slot sections (means 14, 28, 42, …).